The high-speed doors from Hart Door Systems, Newcastle upon Tyne, were installed in an existing maturation store following refurbishment. The company says the Speedors act as airlock doors to improve environmental standards due to their fast open/close cycle. 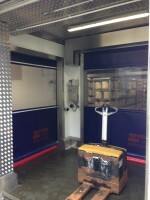 In this instance, where Stilton cheese is produced under the ‘Tuxford’ and ‘Tebbutt’ brands, the doors featured stainless steel to facilitate cleaning in a ‘clean-down’ area,” explains Julian Britnell, sales manager, Hart Door Systems.